"The perfect little bite size treat for your adorable pet. This recipe, as well as other recipes for pet treats, can be stored for later enjoyment. 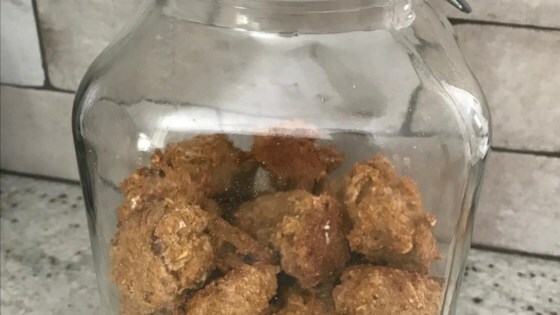 Since they are baked quite hard, you can keep them in an airtight container for approximately 2 weeks"
Mix the whole wheat flour, cornmeal, rolled oats, and baking powder together in a bowl. Lightly mix the water, applesauce, and vanilla extract into the flour mixture. Stir the eggs and peanut butter into the mixture. Turn the dough onto a floured surface and knead until no longer sticky, about 1 minute. Roll out the dough to 1/4-inch thickness; cut into 75 small squares and arrange onto baking sheets. Bake in the preheated oven for 15 minutes. Turn the oven off and allow the treats to sit in the oven as it cools another 30 minutes. Remove the treats from the oven; allow the treats to cool on the baking sheets for 10 minutes before removing to a wire rack to cool completely. My four legged niece loves these. I score them to make them easier to break into smaller treats using a pizza wheel pressed lightly.